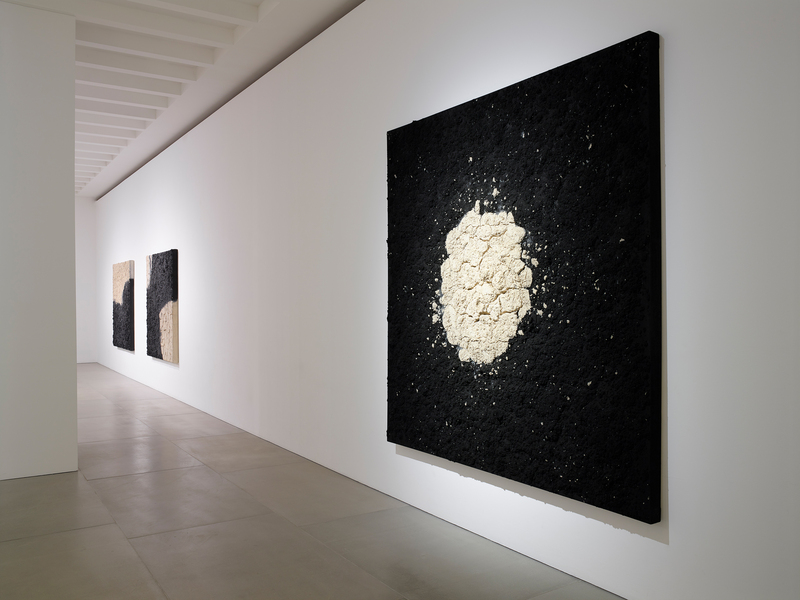 Bosco Sodi is back in the UK, showing some of his most recent creations and curating a small exhibition, at Blain|Southern, London. After collaborating with the gallery for Art Night 2018, where he built Muro (2 meter high by 8 meter long wall) in the middle of London’s South Bank centre, only for people to dismantle it (think Trump, the wall…), Sodi returned to Blain|Southern. 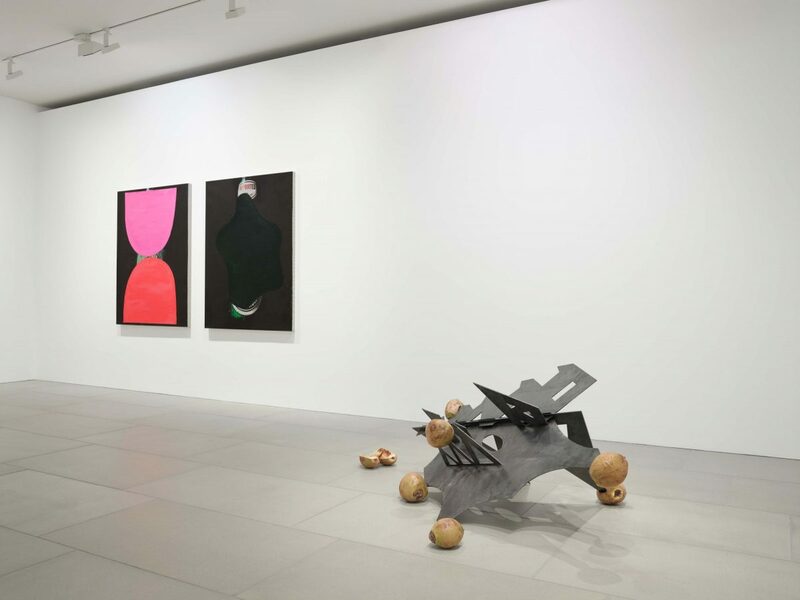 The gallery displays 13 new works that are as organic as magnetic. 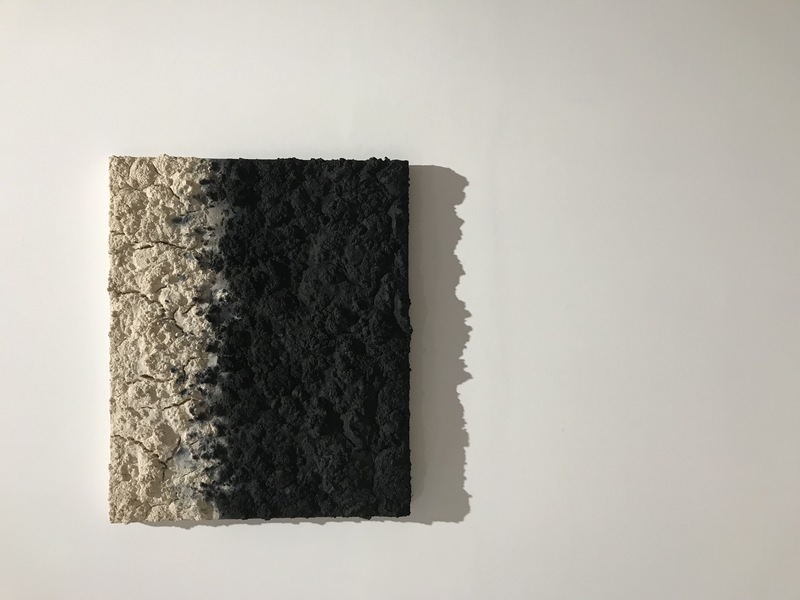 Best known for his richly textured, vividly colored large-scale paintings, Sodi has discovered an emotive power within the essential crudeness of natural materials. 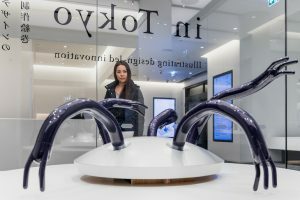 Focusing on an organic exploration of the matter, as well as of the creative gesture Sodi seeks to transcend conceptual barriers. 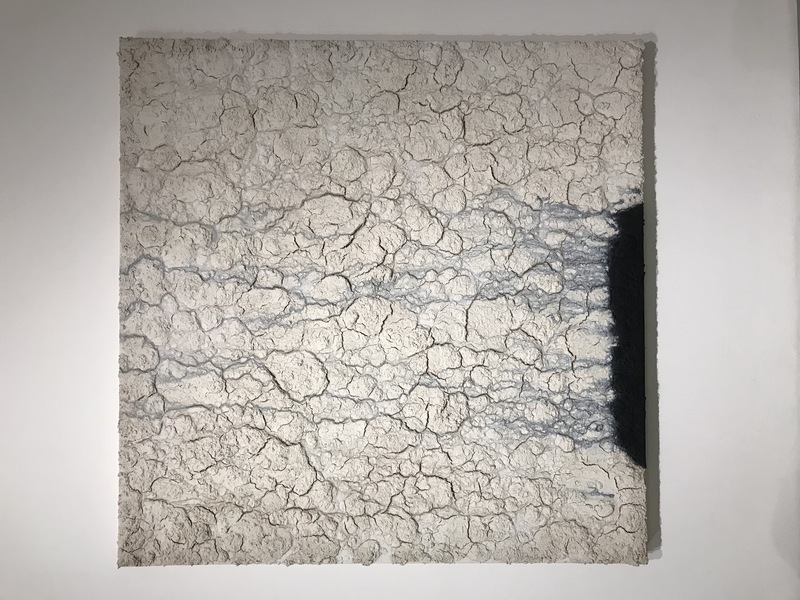 He constructs a solid spiritual connection between himself, his work, and his materials. Pure pigments, glue, dust, air… all are equally part of the creation. As Minimalism and Abstract art taught us, process is more important than form; chance must dominate over rationality. In the act of creating his structural ‘paintings,’ Sodi works in a sort of trance. Using only his hands, he jumps into the canvas and starts working until, for some reason that eludes any rational plan, he is happy with it. Once he decides the work is finished, he never goes back and retouches it. Atmosphere, dump, dust, light will do the rest. Many times, he does not really know how the conglomeration of volcanic matter and pigments will turn out. 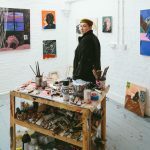 The other day, for instance, he left his Brooklyn studio to come to London, and was in a panic since he left a painting to dry and had no idea of how it was looking. 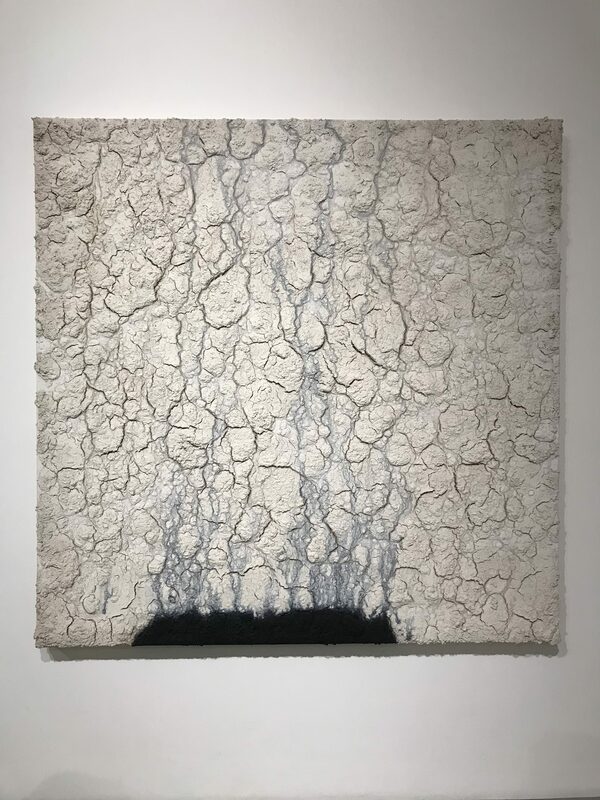 The work itself becomes a memory and a relic symbolic of the artist’s conversation with the raw material that brought the painting into creation. Sodi’s influences range from l’art informel, looking to artists such as Antoni Tàpies and Jean Dubuffet, to master colorists such as Willem de Kooning, Mark Rothko, and the bright hues of his native heritage. In this new series of relief paintings, Sodi introduces, for the first time, a stark contrast between darkness and light. this creates a dialogue between opposing forces which is both spiritual (black and white, life and death) and aesthetic. 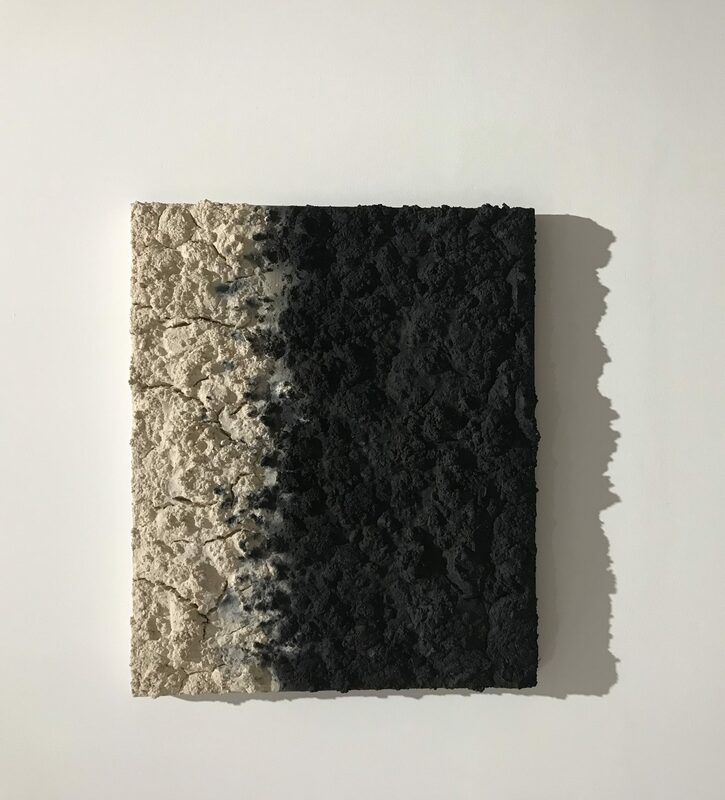 Sodi combines black and white pigments with glue and organic material, such as sawdust or natural fibres, introducing an element of impurity. His relationship with these crude materials draws from wabi-sabi, a Japanese aesthetic philosophy that embraces imperfection and reveres natural authenticity above all. The paintings are the outcome of an intensively physical process in which experimentation and chance play an important role. Laying the canvas horizontally, Sodi sculpturally layers his paint mixture by hand over several days, stopping at the first signs of cracking. 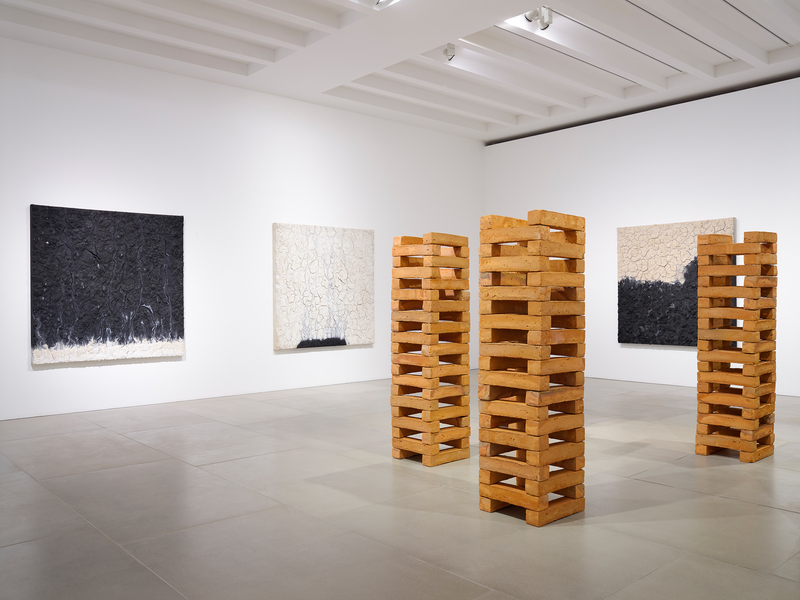 He then gives the process over to time and the elements, as the work dries and fissures form across its surface. The exhibition is punctuated by free standing sculptures made from hand-made bricks created at Casa Wabi using local clay and fired in rustic kilns. Each kiln burns differently, which results in variations in the texture and colour of the individual bricks. Art’Fundación Casa Wabi is the brainchild of Sodi. In the heart of Oaxaca, it constitutes an interdisciplinary project aimed at promoting and sponsoring the exchange of ideas. It supports the development new opportunities for contemporary art in Mexico, providing an important platform for engendering innovative dialogues crossing national and cultural boundaries. 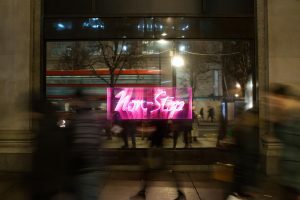 The centre invites artists from all over the world, and working across several different media, to share their ideas and art. Following the wabi-sabi philosophy that inspires Sodi’s work, the foundation was designed by Japanese architect Tadao Ando. Casa Wabi, part gallery, part studio, part community hosts internationally acclaimed artists and offers incredible artist residency. ‘Come here and do what you want… in fact, you don’t even have to do anything if you don’t feel like it. Join us and simply get inspired.’ this is how it works. The only obligation is for residents to get involved with the community and the people in Oaxaca. In collaboration with Casa Wabi’s former chief curator, Alberto Ríos, Sodi co-curated the exhibition Approaching Abstraction. 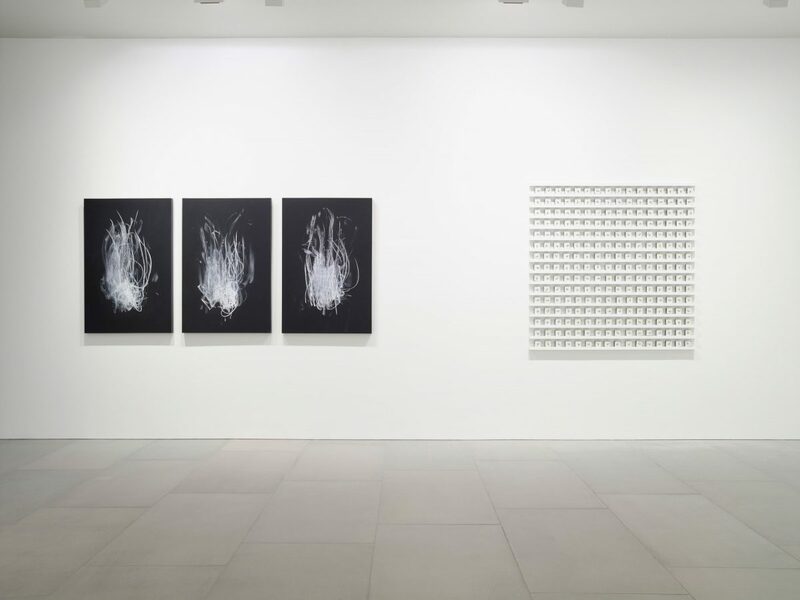 This group show, hosted in the lower gallery at Blain|Southern, showcases a movement amongst Mexican artists towards abstract and monochromatic works. 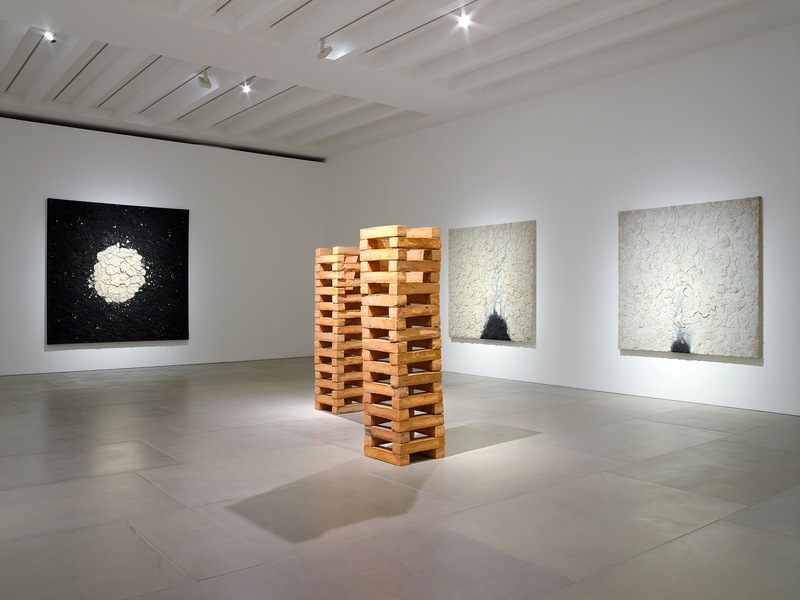 Presenting work by nine Mexican artists working across a variety of different mediums, the exhibition is divided into four themes: time, architecture and landscape, historical commentary and socio-political critique. Performance artist Galia Eibenschutz’s pastel drawings are a combination of dance and draftsmanship. Documenting the sequence of movements of her body makes within space and across the passage of time, her ‘instants’ – on view here as a triptych – were all completed as part of the same performance. 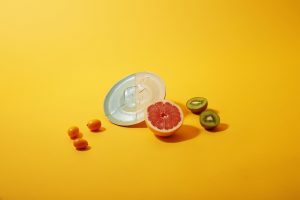 Time can be seen and heard in the work of Tania Candiani. Sobra el tiempo (2008), an installation of 240 ticking alarm clocks is an early example of her research into time as a construct. 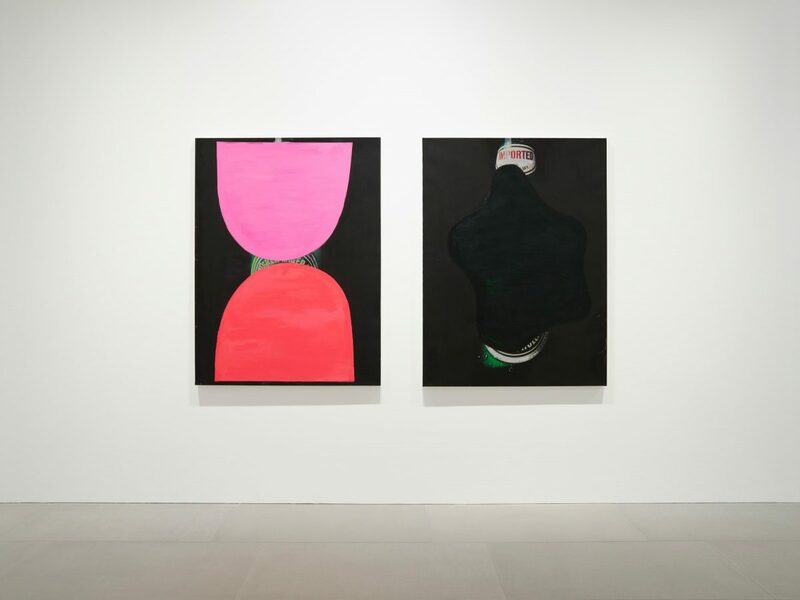 This entry was posted in Art Reviews., EXHIBITIONS and tagged art foundation, art residency, Blain|Southern, Blain|Southern gallery, bosco sodi, Casa Wabi, gallery, Japan, Japanese philosophy, Mexico, Philosophy, sodi, wabi, wabi-sari. Bookmark the permalink.